Save time and money with these 10 smart house organization ideas. These budget-friendly organizing tips help you create order at home and keep it that way. Back to school is happening now, and before you know it, the holiday season will be right behind it. 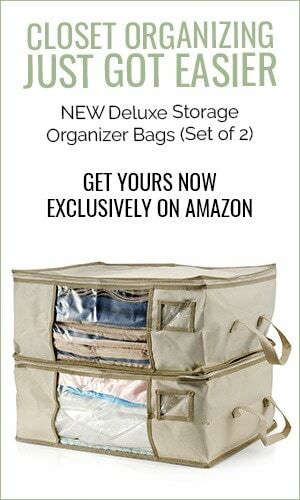 There has never been a better time to get your home organized! When it comes to house organization, these ideas won’t just help you save time, but also your money too! When we become unorganized, we tend to buy more than we need, and we can never find the things we do need. Here are 10 smart house organization ideas that save time and money. Loose papers are the enemy of an organized home. In fact, one of the most challenging items to store are all the papers our kids collect over the years. An easy way to fight the chaos is to set aside a container for each child in your home and keep all of their schoolwork, artwork, and important documents in the bin. At the end of the year, go through it and get rid of anything you don’t want to keep. To save time and money, buy a smaller plastic bin. That way, you are forced to make decisions about what to keep and you don’t collect too many papers all at once. Small things can be difficult to store. Use a shoe organizer on the back of a door to hold seasoning packets, extra toiletries, or even jewelry. The back of the door or in closets is such amazing space that can be used for storage. Hanging organizers will free up space on your counters and in your closets. Remember to label the spots you use in the hanging organizer. This way, anyone else that cleans up will know where to put stuff. Another way to save time and money is to establish a central location where everyone can see the calendar and locate important family information. Wherever your central hub is in your home, create a command center there. Include everything you and your family needs all in one spot! Keep your meal plan, family calendar, mail drop zone, and anything else your family needs all in one place. Instead of keeping boxes and bins on your counter, store items such as q-tips and cotton balls in beautiful jars that will act as a functional display piece. Storing these items in glass jars will make them easier to find – you can literally see what is inside the jars. Plus, it minimizes cleaning time since you know exactly where to put things you use. Don’t have a pantry? Transform one of your closets into one! Add some shelving into your closet to create your pantry. Having an organized pantry is such a time saver! It cuts down on wasted time trying to figure out where to put your groceries, and makes meal prep super fast because you know exactly what you have (and what you need to buy). Plus, having a well-organized pantry will save you money too. It will cut down on food waste because you’ll be able to see everything you own. It will also save you from buying 3 jars of soy sauce, all because you didn’t know where the other 2 were located. The next tip is especially helpful for anyone with really small children. How much time do you spend helping them hang up their clothes? Instead of always having to help your kids hang their clothes up, use open bins to store your children’s clothes. This way, they can learn to put their clothes away. You can also label the bins for them so they can take charge of this household chore, freeing your time up to do other things around the home. Whether you use drawers or a closet, make a gift wrap station. Include any wrapping paper, tape, scissors, bows, and anything else you might need to wrap a gift. 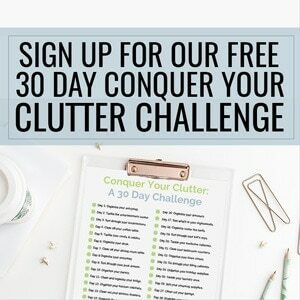 The Clutter Keeper Hanging Gift Wrap Storage Organizer is perfect for this task. It allows you to keep everything you need all in one spot. You can hang it on the back of a door or in a closet until you’re ready to wrap a gift. You might be surprised at how many duplicate items you have when you see them all out and organized. Cut down on waste and time spent trying to find your supplies by establishing a gift station in a closet of your house. How much time do you think is spent replacing small things like nail clippers and tweezers? Instead of letting things get lost in the drawers, use drawer dividers to keep things organized! Put in a few dollar store drawer dividers and keep all of your like items together. Or, check out our 10 favorite hacks to organize your home for a DIY drawer divider idea. When you don’t have a lot of time to spare, baskets can save your home from staying messy. Make a basket for each member of your family, and when you find something out of place, put it in their basket to put away. Keep this time-saving tip in mind: Make sure the items in the basket are put away every day. This will prevent the basket from becoming too full, and possibly overflowing on top of the other baskets. Keep a notepad on your fridge to write down anything you have run out of while you are cooking. Also, keep a running inventory, so you know what you have on hand and what you need when you’re ready to make your grocery list. You don’t have to be an organizing expert to save time and money in your home! 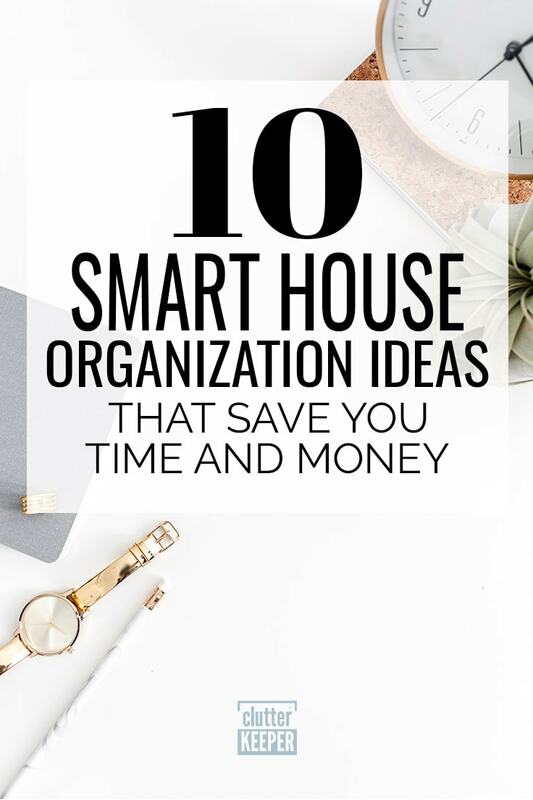 These smart house organization ideas will do all the work for you so you can put those savings on autopilot! Ready to organize other areas of your home? 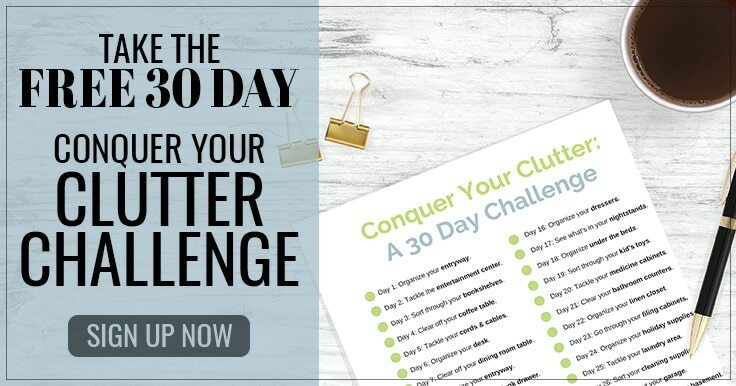 These articles will help you get organized and stay organized.